Yeah, it's Friday again. This week just flew by. 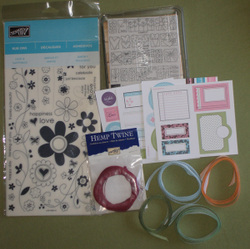 It's already time for Beate's weekend sketch challenge again. As I said in one of my previous posts, I'm trying to get ahead on my stash of birthday cards. So I used the Confetti Simply Scrappin' Kit and the Big Bold Birthday stamp set and made this card. I now realize in looking at the sketch and my card together that the ribbon should have gone the entire distance across the front of the card. I hope this still fits the requirements for the challenge. Truth be told, I'm not sure I could use that much of this ribbon! I don't know why I do this, but I purchase the packages of ribbon originals and then I never use them. Then they retire and I'm left with several packages of unopened gorgeous ribbon that I won't use because it's retired. Am I the only one who does this? I pulled my packages of ribbon originals out of the drawer where they were stashed and put them with all the other ribbon that's current so I'll use it. That's the goal anyway. 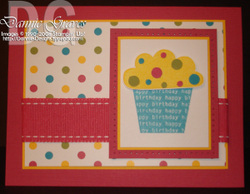 I stamped the cupcake frosting in Summer Sun ink on Whisper White cardstock and cut it out. I wanted the cupcake to have sprinkles so I punched out some circles with my 1/8" and 1/4" circle punches. I adhered the circles to the "frosting" and then attached it to my card with dimensionals. I restrained myself and only added paper piercing around the Rose Red layer that the cupcake is on. I wanted to add more, but I decided to keep my card simple. It took me less than 15 minutes to make this card. This winter the weather has been crazy. Many of you in the north were getting snow in May. Two weeks ago here in California it was over 100 degrees. Yet yesterday I had to pull out my long sleeve shirts for part of the day because I was cold. This weather can't seem to make up its mind. One of the reasons I look forward to the warmer weather is that it means the end of the cold and flu season. But that doesn't seem to be the case this year. So many of my friends are sick right now. I'm just getting over a cold myself. All of that yucky stuff is supposed to go away as the warmer weather rolls in. As the winter weather seems to be hanging on longer this year, so are the colds. So today I decided to make some get well cards. 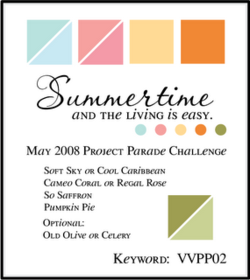 My inspiration for the layout came from Jen del Muro's card on the Verve blog. 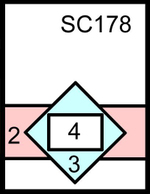 This layout would work with so many different stamp sets. I'll definitely be using this one again. 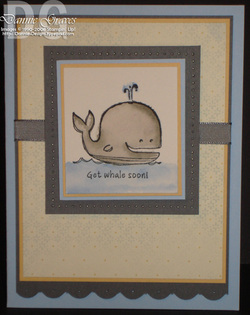 I stamped the whale on watercolor paper with Black Stazon ink. I watercolored him with an Aqua Painter and my Bashful Blue and Going Gray reinkers. At first I stamped the whale with Basic Black ink and it turned into a mess. Purple bled out of the black ink as I watercolored the image. The words were all fuzzy too and you couldn't really read them. So if you're going to watercolor, use Stazon ink. I wanted to use a piece of Designer Series Paper that had a soft blue print on it so I used the Le Jardin DSP. I love the subtle pattern and colors. Usually when I make a card, I try to fill in all the spaces. I find myself wanting to put something in the open space below the whale. My card in yesterday's post also has a big open space on it. I'm learning to let go and be happy with the open spaces. Today's Sketch Challenge on SplitCoast was a lot of fun. I like the clean, simple lines of the sketch and the wide open space on the background layer. Layer 4 was optional so I decided to leave it off my card. I bought the Just Celebrate stamp set from the Occasions mini catalog a while ago and this is the first time it has seen ink. It seems that lately whenever I want to stamp, I tend to grab one my favorite two or three stamp sets and use those. I'm trying to branch out and use all of my stuff so the other stamps don't feel neglected! I stamped my flowers on Whisper White cardstock and then again on two different pieces of Summer Picnic designer series paper. I used the red piece with the little white polka dots and the blue piece with little white polka dots. If you click on the photo above you'll see a larger image so you can see all of the polka dots. I cut the flowers out of the DSP and attached them to my Whisper White cardstock with dimensionals. I used my 1/8" Circle Punch and some Real Red cardstock for the centers of the blue flowers. I finished the flower panel by adding a layer of Bashful Blue cardstock and a layer of Real Red cardstock (paper pierced of course!). I hadn't realized how large the flower panel was until I went to put the card together. I had originally planned to have the striped grosgrain go completely behind the flower panel, but you could barely see it because the panel was so wide. I fixed that by punching two holes in the flower panel with my 1/8" circle punch and threading my ribbon through the holes. I added some interest to the strip of cardstock going across the card by scalloping the edge of the Real Red cardstock with my Corner Rounder. And yes, I had to add some paper piercing in each of the scallops. #12 Lynda Emerson who shared a yummy recipe for Chinese Chicken Salad. Lynda, email me (DannieGrvs@hotmail.com) your address and I'll get these goodies in the mail to you. I wanted to thank all of you for the wonderful recipes you shared. I can't wait to try them. If you haven't taken a look already, click over to this post and look at all of the recipes. It will make you hungry just reading through them. There are enough recipes in there for over 3 months worth of dinner. It has been a while since I've made a 3D project so I thought I'd make one today. Last week's Try a New Technique challenge on SplitCoast was to make a Double Pocket Bag (click here to see the tutorial). I like the way it turned out, but I wanted the stripes to be vertical. 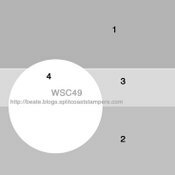 What I should have done is started in step one of the tutorial with the striped side of my designer series paper facing down with the stripes going side to side. Then it would have turned out the way I wanted it to. I still like it though. I used my corner rounder to scallop both sides of the Old Olive cardstock. I added a layer of Bashful Blue cardstock on top and added two rows of paper piercing. I also pierced holes in each of the scallops. I finished the front panel with some Old Olive Wide Grosgrain, several of the Die-cut Blooms from the Occasions Mini Catalog, and a red Rhinestone Brad. I used my Crop-a-dial, Jumbo Eyelets, and Old Olive Wide Grosgrain ribbon for the handles. 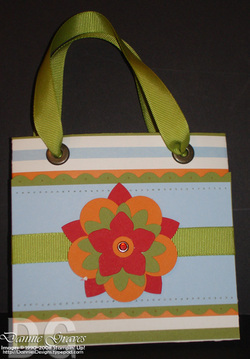 I'm going to make some coordinating 3x3 cards to tuck inside the bag to give as a gift. I hope you're having a wonderful Memorial Day. I took a quick break from the activities today to sneak into my stamp room and make a card. I skipped this sketch challenge at SplitCoast so I used it for today's card. I made this card for my mom so I wanted it to have lots of flowers. Not only did the Fall Flowers designer series paper have lots of flowers, but it also had a great color combination to work with. I used two of the large flowers from the Pretties Kit and offset them to make the flower thicker. I colored them with an Aqua Painter and my Really Rust reinker. 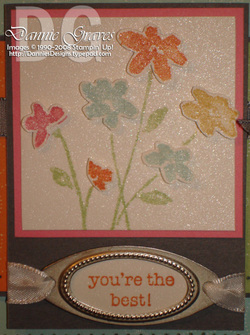 I used one of the silver brads from the Styled Silver Hodgepodge Hardware set for the center of my flower. 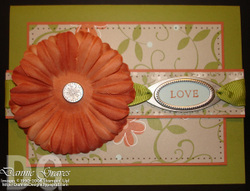 I stamped the word "love" in Really Rust ink on Soft Sky cardstock. Soft Sky isn't one of the dominant colors in the Fall Flowers DSP, but it's in there. I punched the word out using my small Oval Punch and glued it to the back of the oval Styled Silver Hodgepodge Hardware. 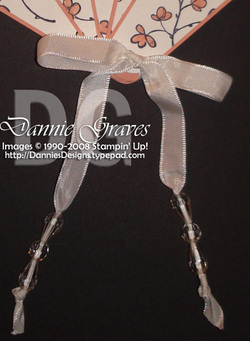 Of course my card wouldn't be finished without paper piercing, ribbon and dimensionals. I wanted to take a minute to say that I'm grateful for all of the servicemen and women who have fought and are currently fighting to give us this wonderful country that we live in today. My brother is currently serving our country in Afghanistan. I love and miss him, but I also know that he is where he needs to be. Thank you. Wow, I have received some wonderful recipes. Thank you so much! If you haven't done so already, scroll down to the post just below this one and enter to win some blog candy. You have until Monday evening at midnight to enter. Last night around midnight I got my 200,000th hit. That is so exciting. Then this morning I found out that I was the featured stamper on SUDSOL. How cool is that? Then to top it all off I just had a new demonstrator sign up under me. Somebody pinch me! What an exciting day. I could barely sit still which is why it has taken me this long to post a card today. My mind has been spinning all morning and I needed something to focus my attention so I could stamp. So I used Beate's weekend sketch challenge for today's card. The base of this card is 4 1/4" square. I used Bali Breeze Designer Series Paper and my Sweet Celebrations stamp set to make a birthday card. I'm trying to be better about sending birthday cards on time, so I made this card to add to my stash. Have you noticed that I'm addicted to paper piercing? It's so much fun. I added a row around the edge of the DSP as well as around the scalloped circle. I pierced three more holes in the bottom right corner and added some turquoise brads. I'm also addicted to dimensionals (maybe I should just admit that I'm addicted to all things related to stamping!). There are dimensionals behind the turquoise heart, behind the scalloped circle, and behind the River Rock cardstock. I love the way dimensionals add depth and interest to a card. Some time this evening one of you will be my 200,000th hit on my blog! I can't believe it. Thank you for visiting me and leaving the kindest comments. I have met some wonderful people through this blog. As my way of thanking you, I've got some blog candy! What's included? A set of Love and Happiness Rub-ons, A Little Bit of Happiness stamp set, four accent and elements sheets, a package of red hemp twine, and an assortment of four different ribbons. How do you enter? Simply leave a comment on this post sharing a quick and easy dinner recipe with me. I struggle with what to make for dinner each night and I'd love to try some new ideas. One entry per person please. I'll leave this open through midnight (Pacific time) on Monday, May 26th. I'll randomly select a winner and post their name on Tuesday. As you know from some of my previous posts, I'm color challenged. 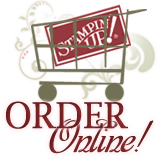 I take the easy route and just use the colors that Stampin' Up! uses in their designer series paper. I figure I can't go wrong that way. I usually skip most color challenges unless they're colors I've already worked with together. This week, however, I was really drawn to this color challenge posted on the Verve blog. I'm not sure what I was thinking--five different colors! Well, I decided to give it a try using this Mojo sketch by Julee. Check it out, I did it!!! 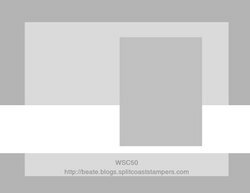 All five colors are there plus two neutrals. I think that's a record for me. If you click on the photo, you'll see it enlarged. The Pumpkin Pie, Certainly Celery, So Saffron, and Soft Sky pieces are all Prints Designer Series Papers. I used the same pattern on each of those pieces--the little white flowers. 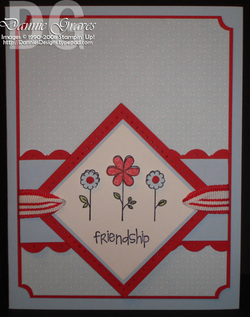 I stamped the flower image from "Close as a Memory" on Shimmery White cardstock. I love the way it shimmers and sparkles. I stamped the flowers again on another piece of Shimmery White cardstock and cut each flower out and popped them up on a dimensional. I used a piece of the Styled Silver Hodgepodge Hardware for my sentiment. This is my first time using it and I really like the color. I finished my card with two colors of Taffeta ribbon, paper piercing, and lots of dimensionals. Each month at my downline meeting we take turns providing the projects. 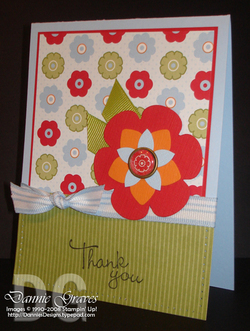 Last week was Donna's turn and she showed us how to make these darling fan cards. Isn't that pretty? It was fairly easy to make too. I lined up all of the white fan blades next to each other and stamped the flowers from the Embrace Life stamp set in Basic Black ink. That way the flowers lined up from one fan blade to the next. I colored the flowers with Groovy Guava ink by putting a couple of drops of reinker on a blender pen. Next I mounted all the White fan blades onto the Groovy Guava fan blades. I stacked all of the fan blades on top of each other and punched a 1/8" hole with my Crop-a-dial through the narrow end of the blades. I threaded some Whisper White Taffeta Ribbon through the hole and tied it in a bow. I threaded the end of the ribbon through the largest needle from my Crafters' Tool Kit. I threaded three beads from the Pretties Kit onto each end of the ribbon and then tied a knot. They're a little difficult to see in the photo because they're clear. There are two tear drop shaped beads with a round bead in the middle. Here's what the back of the fan looks like. 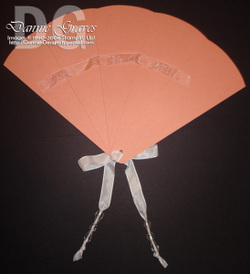 In order to keep the fan blades from opening too wide, you need to use glue dots and some narrow organdy ribbon. Here's where you get to benefit from my mistakes! Looking at the back of my fan, the right fan blade is on top (meaning you can see that entire fan blade while the rest are tucked behind each other). 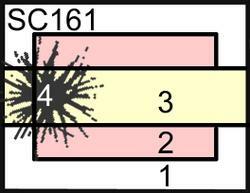 That means that you need to put the glue dots along the LEFT side of each blade. Why? So that you can actually close the fan. The first time I did mine I put the glue dot in the middle of my blades and it wouldn't close up like a fan should. 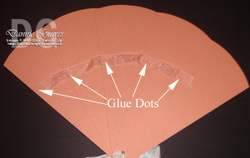 Once the glue dots are in place, take a length of organdy ribbon (about 7 inches) and attach it to each glue dot. And you're done! The finished fan is 9 1/2" across and 6" tall. 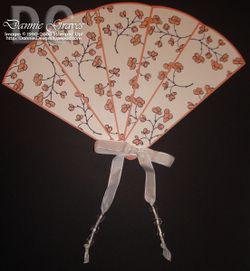 Now I know you want the pattern for the fan, but I'm not sure where Donna got it. When I find out, I'll update this post. Happy Monday! I can't believe another weekend has flown by. Sometimes it takes me a little bit to get back into the swing of stamping after the weekend. This week's Featured Stamper challenge on SplitCoast was perfect to help me get my mojo going again. 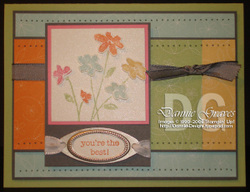 I love Dawn's stamping style and have always admired her cards. It was difficult for me to pick just one of her cards to copy. I finally decided to use this card of Dawn's for my inspiration. I used Summer Picnic Designer Series Paper and Die-cut Blooms from the Occasions mini catalog. I love how bright and cheerful the colors are together. I used the "A Perfect Day" rub-ons for the center of my flower and adhered it to a Build-a-brad. I poked the "legs" of the Build-a-brad through the center of the Die-cut Blooms and then through the Old Olive Wide Grosgrain Ribbon. So the Build-a-brad is holding the ribbon in place. I used a couple of dimensionals to adhere the flower to my card. It's difficult to see in the photo, but I pierced a row of holes around the edge of the green striped DSP. Dawn actually used a sewing machine on her card, but I'm not that talented with a sewing machine. I'll stick with the faux stitching. Thanks for the inspiration Dawn!